The nationally recognized Mummies of the World: The Exhibition will make its debut at the Bowers Museum on March 18, 2016. The exhibition features more than 150 artifacts, real human and animal mummies from across the globe. The display at Bowers Museum will be the first time the exhibit has been to Orange County. 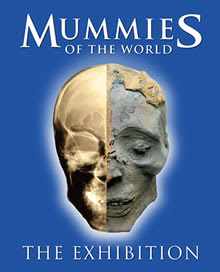 As the largest exhibition of real mummies and related artifacts ever assembled, the exhibit provides a window into the lives of ancient people from every region of the world including Europe, South America and Ancient Egypt, offering unprecedented insights into past cultures and civilizations. Through modern science, Mummies of the World demonstrates how mummification can take place through natural and intentional practices. Included in the collection are the Vac Mummies, a mummified family from Hungary believed to have died from tuberculosis; the Baron Von Holz, a German nobleman found tucked away in the family crypt of a 14th century castle wearing his best leather boots; Egyptian animal mummies including a falcon, a fish, a dog and a baby crocodile, many of which were deliberately preserved to accompany royals for eternity; as well as MUMAB, the first replication of Egyptian mummification done on a decedent body in 2800 years; and much more. Mummies of the World tells the story of the mummies through state-of-the-art multimedia, hands-on interactive stations and cutting-edge 3-D animation taking visitors on a 4,500-year journey to explore the mummies’ history and origins as well as how they were created through both intentional and natural processes. Using CT scans, researchers have determined that prior to death many of the mummies showed evidence of various ailments and illnesses, some of them endemic among families. Mummies of the World will be on display at the Bowers Museum, located at 2002 N Main St, Santa Ana, CA 92706 for a limited time, debuting March 18, 2016. Tickets will be available beginning in February. For more information, please visit www.bowers.org or www.mummiesoftheworld.com.